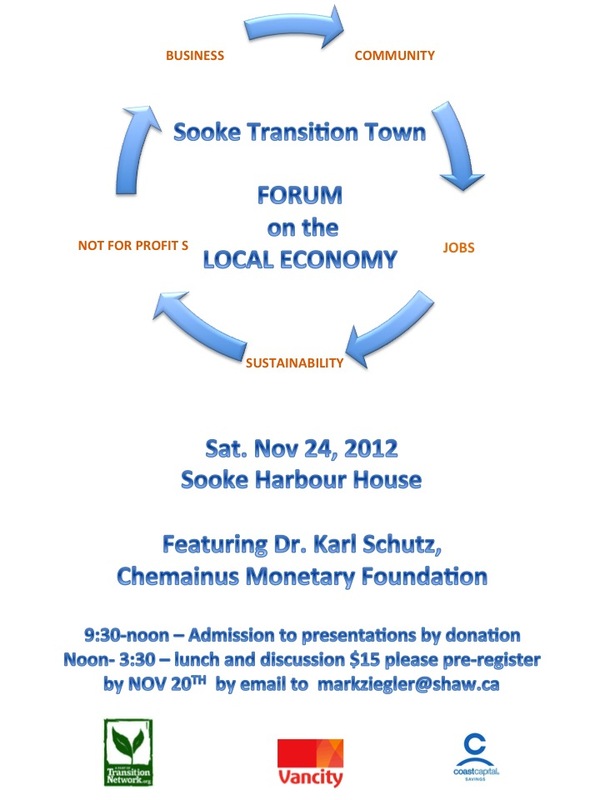 Saturday Nov 24: Help keep Sooke’s economy vibrant with the Forum on the Local Economy! Imagine a country where the only tool is the hammer. That’s what reliance on a single national currency is like. Please join us to learn how ordinary people can add other tools to our toolkit. On Saturday, November 24th, we’re talking about ways we can all keep Sooke’s economy vibrant. Everyone is invited! (And you don’t need to be an economics expert to participate.) Admission is FREE to the morning talks. A few spots are still available for the lunch and afternoon workshop but you must pre-register ($15) – contact Mark Ziegler <markziegler@shaw.ca> Get advice on starting small businesses, learn to make our local economy more resilient, make the 10% shift, and explore possibilities for local currency (led by the founder of the Chemainus dollar) – we’ll be talking about all of this and more. A full agenda is available below and please feel welcome to share this PDF with everyone you think might be interested: Sooke’s economy matters to everyone!